In honor of Women’s History Month, Clark Partington offers a mini-series focused on inspirational women. The featured quotes and the women who spoke them have had an impact on the authors of these blogs. In each blog, you will get to know the influential women in history, as well as a Clark Partington attorney. This third blog was authored by Kelsey Stone as part three of a mini-series focused on inspiring women leaders. We hope you will be inspired, too! Born in the Swat Valley of Pakistan in 1997, Malala Yousafzai became an activist for girls’ education at a young age. Her father ran a local school for girls where Malala and many other girls flourished. The Taliban began tightening their control over the people of the Swat Valley and eventually banned the local girls from attending school or receiving any education. Malala’s response, at the mere age of eleven, was to pen an anonymous blog for the BBC entitled the Diary of Pakistani Schoolgirl, which chronicled her hope to continue her education. She also spoke out publicly against the Taliban and championed the cause of girls’ rights to education. By 2012, the majority of the Taliban was driven out of the Swat Valley. However, on October 9, 2012, on the way home from school Malala heard a man ask “Who is Malala?” She turned towards the voice and was shot in the head but miraculously survived. Malala woke up ten days later in a hospital in England. After her recovery, Malala bravely continued her activism. She and her father established the Malala Fund charity with the goal of advancing every girl’s right to education and to a future of their own choice. The Malala Fund joins forces with local education champions in Afghanistan, Brazil, India, Nigeria, Pakistan, and the Syria Region to advance the process towards secondary education for girls. Her work unites women and men in the common goal of education for all children regardless of gender. In 2014, Malala was awarded the Nobel Peace prize for her work and is the youngest Nobel laureate to date. Kelsey Stone’s practice focuses on civil litigation. She regularly represents individuals in family law matters, title insurers and their insureds, real estate owners, and financial institutions. As a a litigator, she handles real property disputes, business dissolution, title liability, commercial real estate defaults and family law disputes. 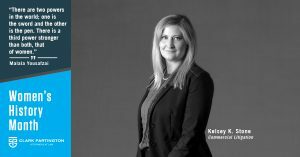 Born and raised in Fort Walton Beach, Kelsey returned to the Panhandle after law school to be closer to family and also help the people of Northwest Florida. She is on the Board of the Young Lawyer’s Division of the Escambia Santa Rosa Bar Association and is a member of the Pensacola Area Inns of Court and the Northwest Florida Association of Women Lawyers. Although she has wanted to be a lawyer since the age of five, Kelsey also has interests beyond the practice of law, including travel, cooking, tennis, and reading. Kelsey can be contacted at kstone@clarkpartington.com or 850.434.3274.